When Orthodox medicine has no answers, then it’s time to get busy and see what alternative treatments are available. This is the first blog post of many. I am also sure that with careful ‘due diligence’ that such methods need not be looked upon as ‘last resorts’ but can be wisely incorporated while orthodox treatments are also being utilized. Every Parent/ patient must carefully consider the pro’s and cons of choosing to try… or ignore… alternatives like this. What is also interesting to consider is that this actually has greater ramifications than curing Cancer. 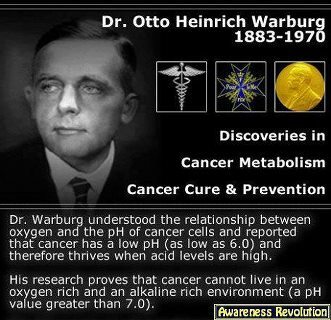 It also means we all should be attempting to have an Alkaline metabolism so as to *prevent* Cancer as well. Dec 31, 2010 | By Adam Cloe Adam Cloe has been published in various scientific journals. He is an M.D./Ph.D. student at the University of Chicago. He has a Bachelor of Arts in biochemistry from Boston University, where he won an award for excellence in undergraduate science writing. The balance of acidic and alkaline substances in your body is important for the function of the proteins and cells in most of your body’s tissues. The balance of acids and bases is often described as the pH; the blood naturally has a pH of around 7.4, which means that there are slightly more alkaline substances than acidic substances in the blood. If your blood becomes too acidic, it puts stress on the body, which can affect your health. There are a number of different ways to increase the alkalinity of your body. Avoid acid-producing foods. Many of the foods in the typical Western diet generate acid in the body, which will neutralize some of the naturally occurring alkaline chemicals in your blood. Acid-producing foods include most meats and dairy products, alcohol, beans and legumes, white pasta and other grains, such as oats, rice, wheat and corn, the Wolfe Clinic explains. According to the acid/alkaline balance theory of diet, reducing your intake of these foods will help raise the amount of alkaline chemicals in your body. Increase your intake of alkaline-producing foods. In addition to reducing the amount of acidic foods you eat, the acid/alkaline balance theory of diet recommends that people eat foods that cause the body to produce alkaline chemicals. Most fruits and vegetables, including citrus fruits, are broken down into alkaline substances upon digestion. Eggs, cottage cheese, fermented tofu, most seeds and many spices also have an alkalizing effect on the body. Take potassium citrate and magnesium citrate supplements. These minerals can help maintain the balance of calcium, sodium, potassium and magnesium that are needed to help the body stay healthy and maintain its pH, AlkalizeForHealth.net explains. Because there is no standard dose of magnesium and potassium citrate, follow the dosing directions on the packaging of the supplement. Take sodium bicarbonate. Sodium bicarbonate is an alkaline substance which is normally produced by the body and can also be taken as a supplement in the form of baking soda. Baking soda can be obtained without a prescription and the dose you need will vary, depending on the condition for which you are taking baking soda. Drugs.com recommends that you follow a doctor’s instructions or follow the directions on the packaging if you take sodium bicarbonate supplements. 5) Foods You Must Not Eat Cut Down a bit of Your Stomach Fat By Avoiding These 5 Common Foods! 5 Foods you must not eat: Cut down a bit of stomach fat every day by never eating these 5 foods. Free Meal Planner Hundreds of Fast & Tasty Recipes Learn w/ the Free Recipe Toolbar! Previous PostPatriots! Boot out the Democrats, and the Republicans,…Next PostConcerning the notion of Liberty, and of moral Agency.